Like many of us, the 17-inch MacBook Pro has learned that it can be dangerous to one’s health to carry around too much bulk. Apple has discontinued the largest member of its laptop line in the wake of its WWDC announcements. If you’re looking to pick up one of Apple’s behemoth laptops, they’re still available—but Apple confirmed to Macworld that it’s only while supplies last. At present you can pick one up in the refurbished section of the online Apple Store, and you may also be able to grab a remaining model by calling the online store or by visiting your local Apple Store. First introduced in 2003 as part of the PowerBook line, Apple’s 17-inch notebook computer has long been the choice for users who needed the power and capability of a desktop without completely sacrificing portability. The 17-inch Intel-based MacBook Pro debuted in 2006, just a few months after the 15-inch model. With the 17-inch model gone, it may seem as though Apple has lost some versatility in its portable lineup. The leviathan of Apple’s laptops usually featured the most powerful processors and graphics cards available, and only it and the 15.4-inch MacBook Pro offered the optional antiglare option. But if you’re looking for a reason why Apple offed the 17-inch now, you need go no further than the 15-inch Retina display MacBook Pro. Not only does it offer the most cutting edge technology of any Apple laptop to date, but its 2880-by-1800 pixel display outstrips the 17-inch’s 1920-by-1200 resolution with room to spare. Add in the fact that the new MacBook Pro is thinner and lighter—to the tune of more than 2 pounds—and it seems pretty clear that the Retina display model is the new target for what a powerhouse portable should be. But somewhere, we’re sure Verne Troyer is shedding a tear. 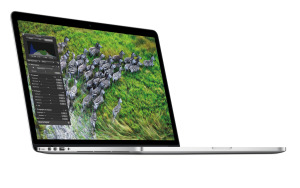 The 17-inch MacBook Pro is no more, but customers can still pick one up while supplies last.